An iconic symbol of NASA's origins as a powerhouse for aviation innovation has found a new home at the Smithsonian's National Air and Space Museum in Washington, DC. NASA Administrator Charles Bolden transferred ownership of a sign shaped like a simple set of wings and emblazoned with the acronym "NACA," to the Smithsonian on March 3, in celebration of the 100th anniversary of the National Advisory Committee for Aeronautics, or NACA. "Its mission, in part, was to 'supervise and direct the scientific study of the problems of flight with a view to their practical solution,'" Bolden said in a statement. "As you all know, we not only regained that edge [over Europe], but we became the world leaders in civil aviation." 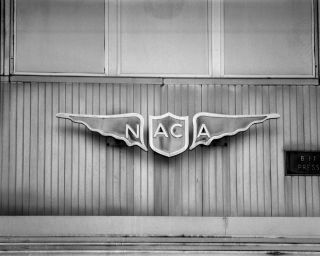 The NACA logo, a set of wings, adorned the agency's "buildings, aircraft, technical reports, and even employee clothing," according to Bolden. In the March 3 presentation, Bolden presented the NACA sign to Jack Dailey, director of NASM. The sign had previously hung above the 8-Foot Transonic Pressure Wind Tunnel at the agency's Langley Research Center in Virginia since 1953. The sign had been on loan to the Smithsonian for many years before Bolden formally transferred ownership to the museum last month. they were designed, tested, and refined. Within the 8-Foot Transonic Wind Tunnel, legendary aeronautical engineer Richard Whitcomb designed the supercritical airfoil — a wing shape that allows planes to fly smoothly even as they approach the speed of sound. NASA Administrator Charles Bolden (left) and Jack Dailey, director of the Smithsonian's National Air and Space Museum, celebrate the NACA sign transfer to the museum in March 2015. Drag-reducing winglets, still seen at the wingtips of all manner of airplanes, were also created in this tunnel, as were many of the space shuttle's aerodynamic features. In 1958, the government formed a new agency in response to the Soviet Union’s 1957 launch of Sputnik, the world's first artificial satellite. That new agency, named the National Aeronautics and Space Administration (NASA), absorbed NACA on October 1, 1958. Many of NACA's staff took high-level positions at NASA to continue their research in aeronautics with a new focus on space exploration. "I hope [the sign] will entice your guests to experience a little sense of aviation history, and, in the telling of that story, inspire more than a few visitors to become tomorrow's aviation pioneers," Bolden said. Dailey then jokingly handed Bolden a set of white gloves, which he said the NASA administrator can use to inspect the sign anytime now that it's an artifact in the Smithsonian's national collection.